Flagship Technologies can save your organization time and money on your next purchase of Dell PowerEdge Rack Servers and spare parts. Running a data center of any significant size usually means using servers mounted in racks to make more efficient use of the available space. Like other brands, Dell PowerEdge rack servers are measured according to the height each one occupies in a rack. This “footprint”, so to speak, is measured in “Us”. 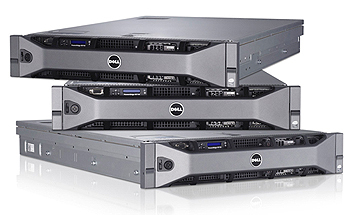 The most popular Dell rack servers measure 1U and 2U while larger servers of 4U, 5U and larger are also available. Typically, the larger the server, the more expansion opportunities available. Dell PowerEdge rack servers usually occupy space with other related data center equipment such as PowerVault storage arrays, UPS backup systems and PowerConnect switches. The nature of rack servers makes it easier to keep the equipment neat and tidy since most racks are designed with cable management in mind. From a hardware perspective, Dell PowerEdge rack servers are intended to be easy to maintain and upgrade since most are mounted on sliding rack rails for quick access to the chassis. In addition, most include hot-swap hard drives and power supplies designed to be simple and convenient to replace.